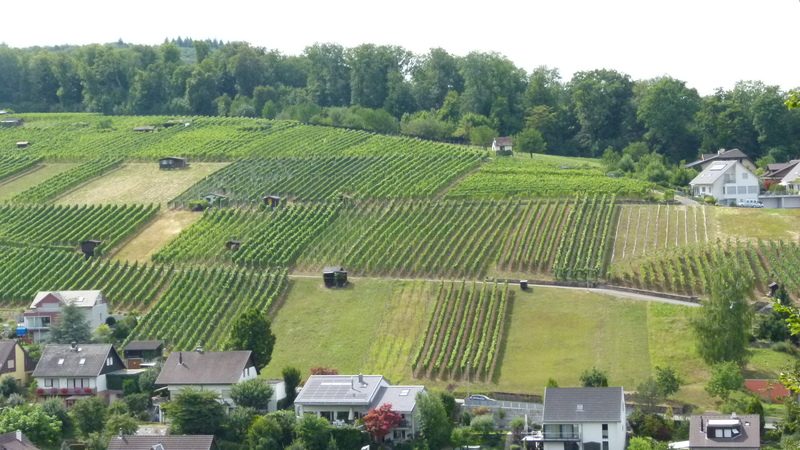 West of Aesch near Basel there is a small valley with southward looking slopes that have a tradition of wine growing – it is the largest wine growing area around Basel. On the hills around the Klus valley there is culture – a dolmen tomb, an old cave and various castles (all ruins). 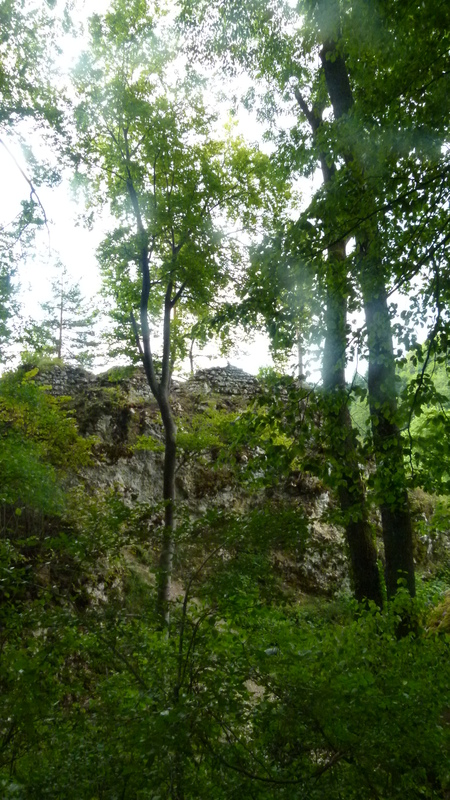 The ruins south of the Klus valley are connected by the marked “Burgengratweg” (“ruin ridge path”), and there is another ruin north of the upper Klus, Frohberg, that is more difficult to reach out to. 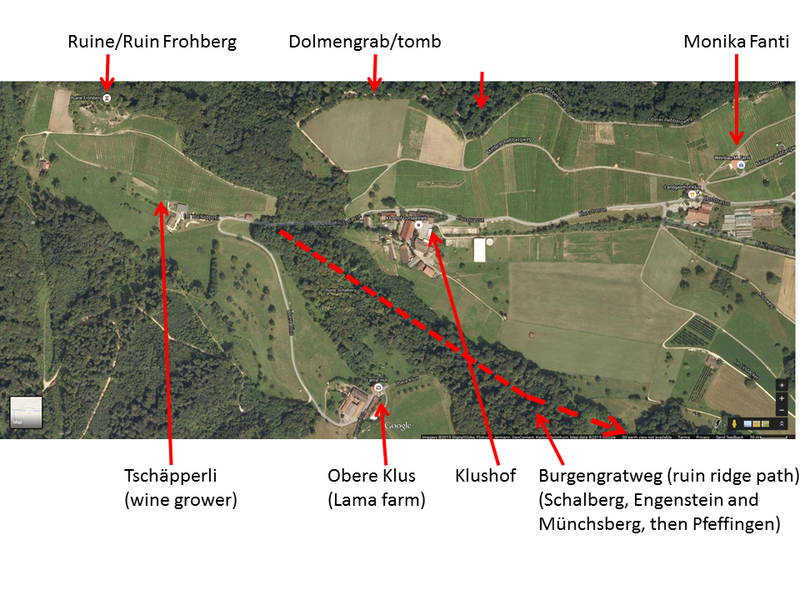 I like the Klus and check out the marked hiking paths and the more hidden unmarked paths to get ready to lead the Monday Nordic Walking group to the tomb and the castles. Thank you, Andreas and Helga, for uncovering the secrets of this valley to me. 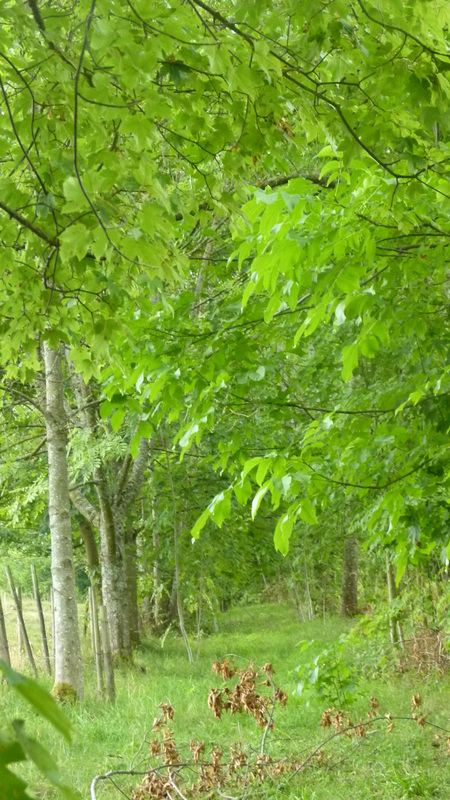 I start my walk above the vineyards in the forest following the yellow hiking signposts. A brown plate directs me to the dolmen tomb. Only the basis of the tomb is left and protected by a fence. 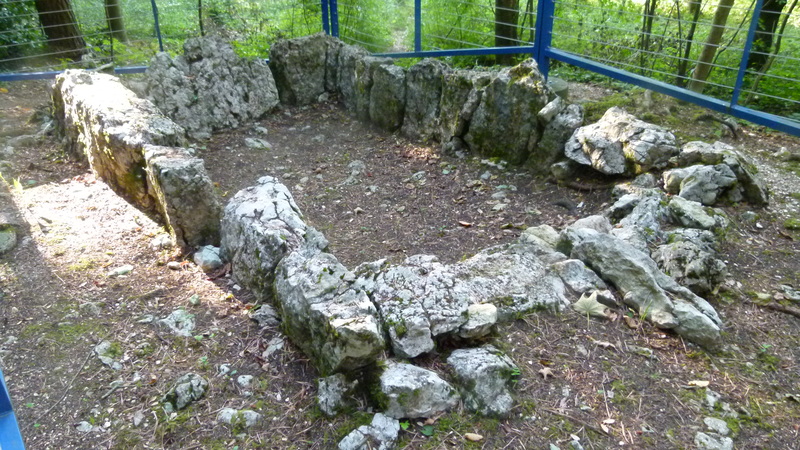 Originally it has been covered with stone slabs and must have been some 2-2.5m high. It has been built around 2500-1500 BC (late stone age or bronze age). 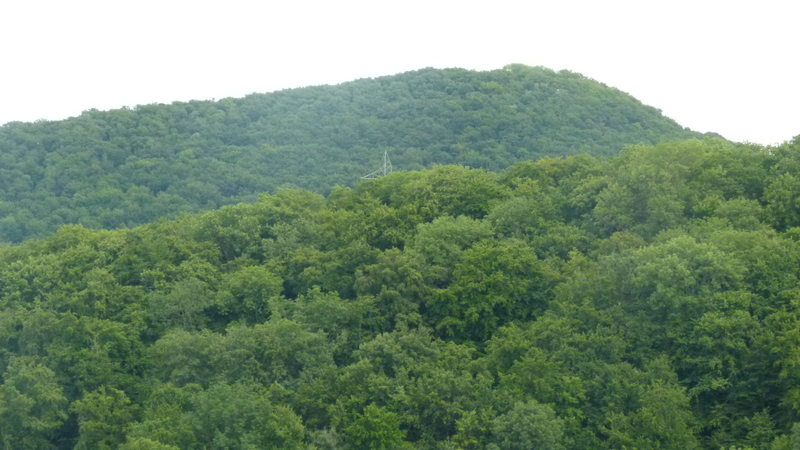 Nearby I have a wonderful view of the Klus vineyards and the forest hiding the ruins along the “Burgengratweg”. The Gempenplateau can be discerned in the background. A narrow path takes me up to the ruin Frohberg that is well protected sitting on the top of an almost inaccessable rock. 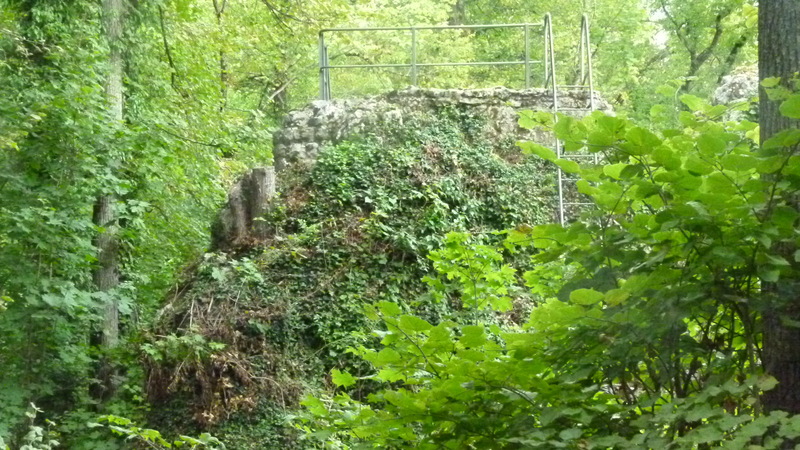 The castle has not been explored by archaeologists. They assume that it has been built by the Schaler family in the 13th century, perhaps as an additional stronghold against the family Münch that also owned a castle overlooking the Klus valley. Like most castles around Basel it has been destroyed in the 1356 earthquake and may not have been reconstructed. Later the bishop of Basel owned Frohberg with the farm Tschöpperli/Tschäpperli and gave it to the family Thierstein as a fief. 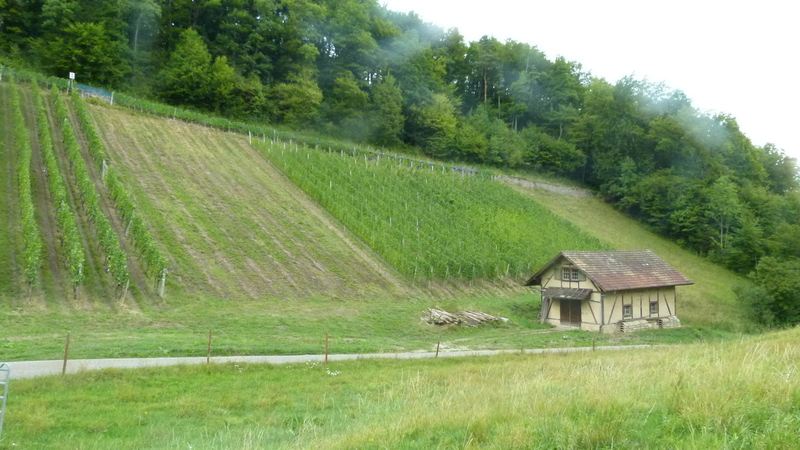 They managed the farm from the nearby castle Pfeffingen. 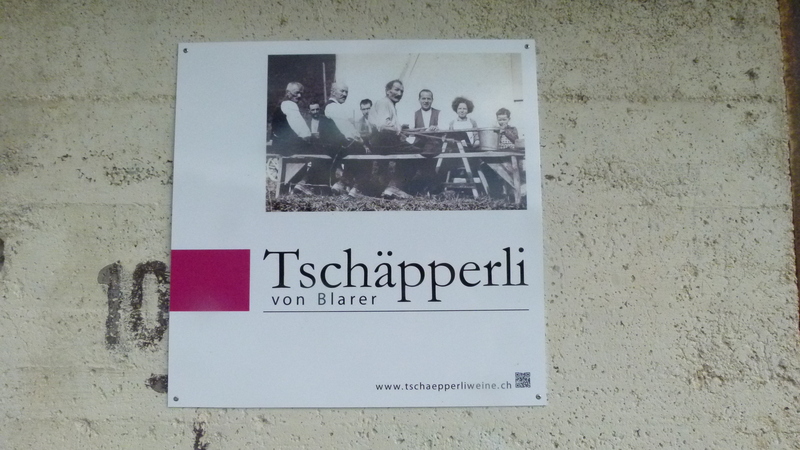 Today, the Tschäpperli farm is one of the renowned wine growers of the Klus. These are some of their vineyards. … take me to this sign announcing llama xing. 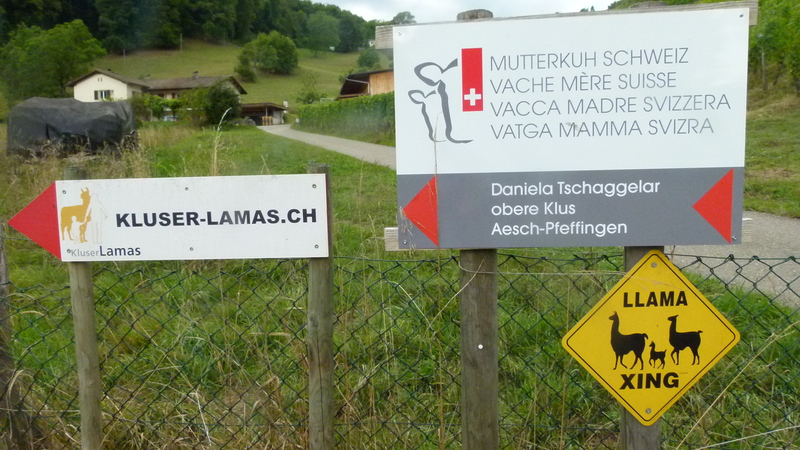 Llama xing – here in Switzerland! Yes, the farm “Obere Klus” has lamas – among other animals. The lamas are rented out for hikes. About 50m down the valley I enter the Burgengratweg. There is warning: The path is not in good state, you go there on your own risk. 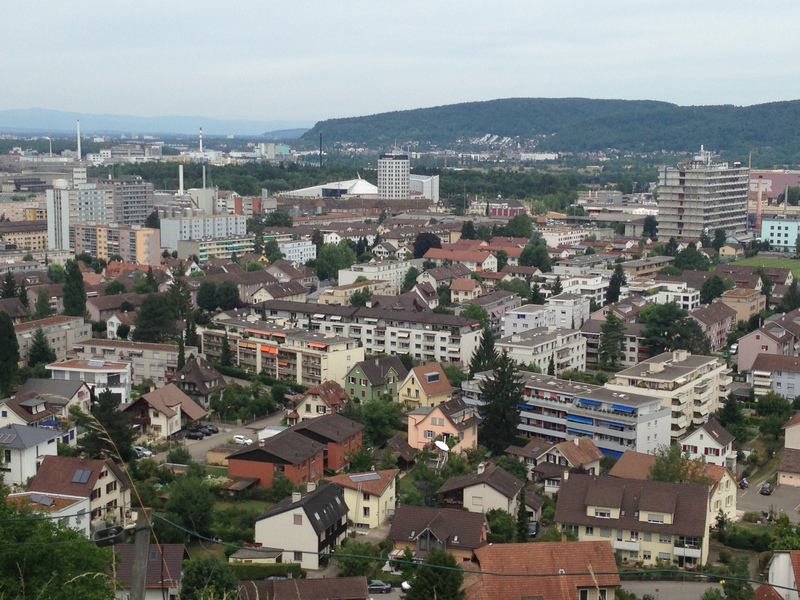 Well, it is narrow, stony, with roots – pretty rough for standards around Basel, but there are more dangerous hiking paths in Switzerland. 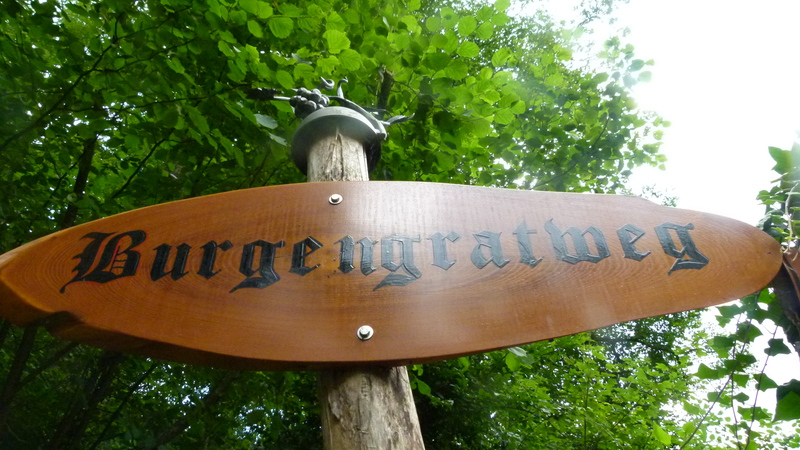 Each of the sights I will come across on the Burgengratweg has a plate that explains the history. 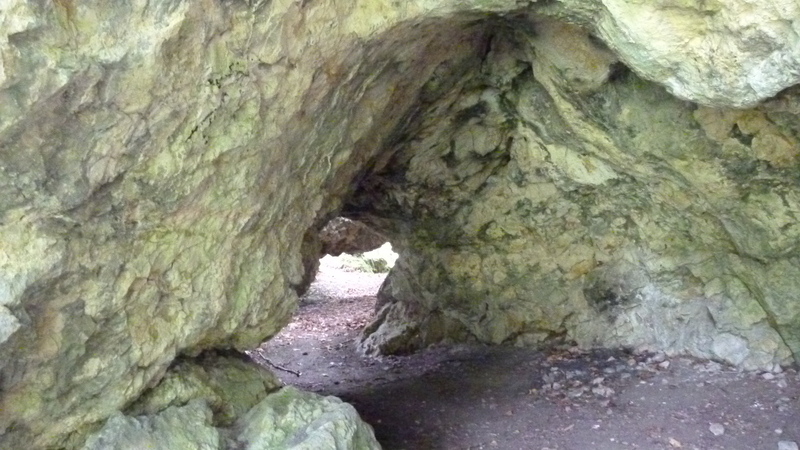 After having crossed a small creek, I reach the Schalberghöhle (Schalberg cave). Firestone tools and animal bones from 50’000 years ago (“Moustérien” ) and from the late stone – and bronze age (about 3500BC and 1000 BC) have been found here. The first castle is Schalberg, built by the family Schaler (they have also built Frohberg). After the earthquake they rebuilt this castle. They later sold it to the bishop of Basel (1437) who gave it to the Thierstein family as a fief. Soon thereafter the castle must have been abandoned, as it is no longer mentioned in the archives. Also the second castle, Engenstein, belonged to the family Schaler. The castle was also called “Alt-” or “Vorder”-Schalberg. A dizzying iron ladder leads to a platform. It has been given up already in 1280, probably, because the family had built the “newer” Schalberg castle not far from here. 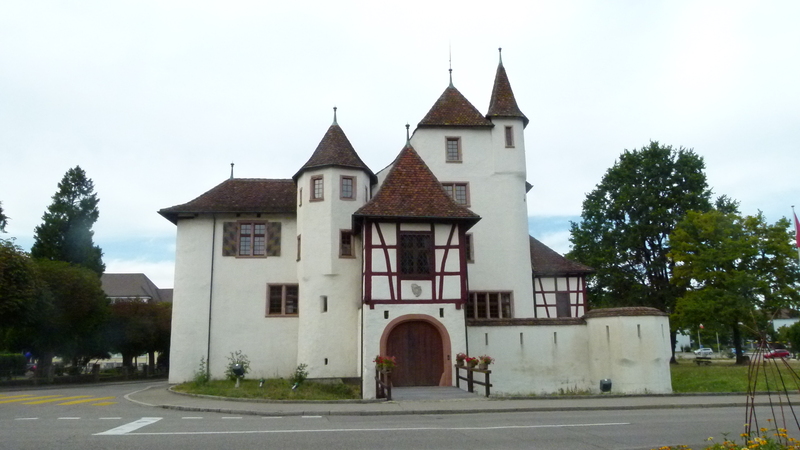 The next castle, Münchsberg, built in the 13th century, belonged to the family Münch that later also sold the castle (with farms) to the bishop of Basel and received it back as a fief. The last castle on the Burgengratweg is Peffingen above Aesch and the namesake village Pfeffingen. Its origins go back to the 11th century. 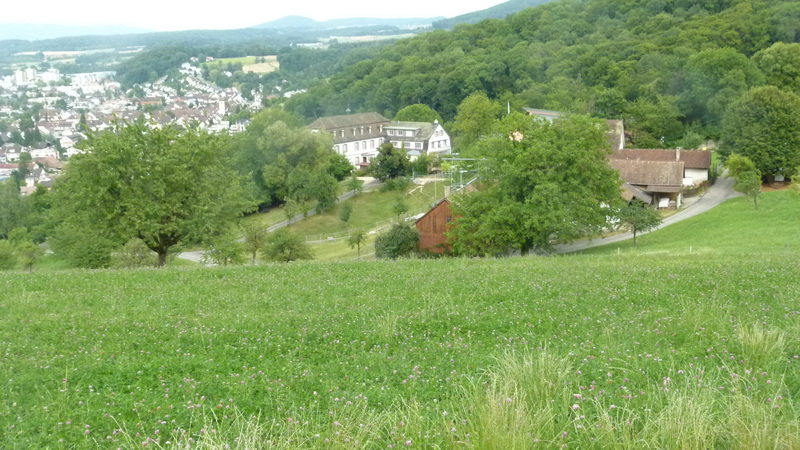 In the 12th century, the family Thierstein owned Pfeffingen (along with nearby Dorneck). From 1522 it belonged to the bishop of Basel; his bailey then lived here. In the late 18th century the castle was abandoned. It is currently being renovated. As it starts to pour with rain, I leave the forest and the narrow, now slippery ruin ridge path. In the rain I prefer to stroll through the vineyards. There is a round tour with posts explaining the business of wine growing throughout the year. Monika Fanti is a winegrower that also runs a small restaurant (“Winzerbaizli” or “little winery pub”). I like the names of her wines: “ilFANTIno”, “exKLUSivo”, “FANTIssimo” and “mySEELEdröpfli” (literally translated: “my soul droplet”). 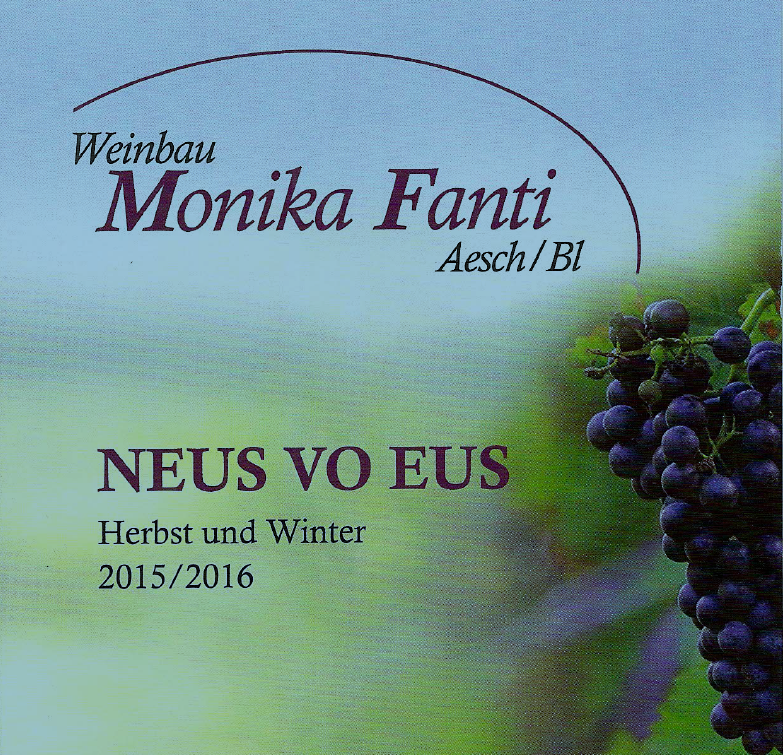 I take a leaflet with me announcing “Neus vo eus”, meaning “news from us” in the dialect of Basle Country. I plan to get back to this place. Some of the wines of Monika Fanti would be a great addition to my gift drawer – besides, of course, trying them out myself. A few meters higher up I find “chez Mitz”, where I can hear laughing through one of the open windows – I think a Sunday brunch is going on. Teddy bears sit on the window sills looking down at the hikers. Really, the Klus of Aesch is a charming corner! I look forward to the Monday walk with the group and I will surely come back more often. A friend of mine owns a Tesla Model S – is he a nerd or a visionary? As I read more and more about e-cars, I start to change my mind: My friend may be an early adopter of e-mobility that might well become a future trend. Traditional car providers such as BMW, Nissan, VW, Mercedes, VW, Renault and even Chinese companies (such as BYD) develop their own e-cars. They would not do so, if they saw no business in it. The Tesla Model S, has recently been rated to be the second most sold luxury car after Mercedes in the US (Newsticker). The “world top 20 half year 2015” edition of ev-sales.blogspot.ch shows Nissan Leaf as the leader worldwide (25068 cars sold in Jan-Jun 2015), while in June 2015 Tesla leads the ranking with almost 5000 cars sold worldwide. Around 200’000 e-cars sold worldwide in Jan-Jun 2015 is of course still a small share of the overall car market. Norwegia subsidizes e-cars giving them privileges such as the right to drive in the bus lane. As a consequence, the number of e-cars ramped up more than in other European countries, in towns, and also in remote northern areas (wikipedia and EV Norway). There must be potential, if waked up by the government. Other European countries are lagging, with Switzerland a bit more ahead: In Switzerland, growth rates of e-car sales are 44%, in particular Toyota and Tesla cars are well adopted (NZZ 29.07.2015: “Das E-Auto wird in Deutschland zum Fiasko”). I am surely not a nerd. I just like to drive my “normal” combustion car that is reliable and also a bit of fun to drive. Are e-cars now becoming reliable and fun to drive, too, even for me? Let me summarize some of my impressions just from the viewpoint of a “normal” potential consumer. At an event organized by one of our local electricity providers, I have the opportunity to gain hands-on experience with e-cars. The Renault Twizy reminds me of the Deux Chevaux back in my university days. Minimalistic. The Twizy may be an attractive advertisement platform for companies or handy for the Pizza service. Not for me, I prefer my “normal” bike for short distances (not yet considering “e”-bikes that recently have become somewhat hype). The BMW i3 is utterly elegant with a GPS showing the charging stations on the map. But why are there so many knobs to manage the car? Why is that not integrated in the electronic cockpit? The Nissan Leaf and Renault Zoe are more sober, but handy to drive. The e-Golf feels like a VW Golf, very robust. VW might have had their current clients in mind, when designing their e-car. and they will surely recognize the experience. All these cars have one problem: The e-charge is empty after 100 to 200 kms (depending on conditions, see Wikipedia entry and 10 Electric Vehicles with the best range in 2015), and recharging takes time. My combustion car can do 700km . Opportunities to load the e-car are still patchy (interesting concept: park & charge with map LEMnet). Some time ago, I traveled in a KIA from Basel to a village near Baden, about 100kms. We start with a reserve for 160kms, reload the car at a normal 220V plug in Baden, find out that after five hours, it has only reloaded to give us 120km. We just about make it back home with 25km left to drive, with the car warning us about “low battery”. Fortunately the navigator shows the loading infrastructure available and hence longer journeys can be tackled with the KIA, but not without hazzle. That evening we took the cable from my garage to recharge the KIA. Though the e-cars are comfortable and so much less noisy to drive, I would not replace my combustion car with any of them right now. I hear that BMW gives out combustion cars to BMW i3 owners, when they plan their vacation in Southern Europe. Tesla, I sense, is similar. It is a different paradigm. It is a car designed as “e” and with a modern “tablet feel”. The computer panel in the Tesla controls most of the functions that other e-cars still have a knob for. It is connected with the Internet and the navigation is based on Google maps. The interface has become “e”, not only the “fuel” of the car. The driver notices my enthusiasm. “Do you want to drive?” I drive uphill on the test run. After a while we stop and try out the navigation system. “London”, we enter as a target point, and after some thinking, the board computer spits out the route that minimizes the “fuel” and shows the Tesla loading stops (“super chargers” that are free). Other than in traditional e-cars, the Tesla cockpit also takes over the task of optimizing the route, and it is all based on Google maps that we are familiar with anyway. Then, the range of the Tesla is higher to start with – 10 Electric Vehicles with the best range in 2015 says 270 miles or about 350km. When traveling in our KIA to Baden, we met my friend, the “techie-nerd”, who owns a Tesla. He mentions that since his experience with the hotel going black when trying to recharge his Tesla, the supercharger infrastructure has improved a lot. Frowning he looks at the front trunk of the KIA:”What is this? It looks like usual combustion car, why does the electric “engine” use up all this space – look at my front trunk”. He opens it, and it is empty – well – not really – his set of Tesla plugs are carefully stowed away in an edge of the empty trunk. “Yes, they have designed the Tesla from scratch”, my friend says. I am impressed. The Tesla Model S is different… though the entry level is still high: Around 100’000 CHF. However, the total cost of ownership may come closer to traditional cars, as charging “fuel” is free. But it is still more expensive compared to e.g. the KIA that goes for about 27’000 CHF. Though the Tesla Model S is a tempting option to replace my combustion car, I still do not intend to acquire one right now considering the high entry level prize and the size of the model S (not really for small people like me). Maybe, my eyes permitting, I would reconsider buying a Tesla, when the smaller Tesla model 3 comes out and scaling lowers its entry level price. But I am fascinated and want to learn more about the driving force behind Tesla, Elon Musk. He seems to be a visionary and challenging leader, like Steve Jobs was… I buy his biography. This year – 2015 – I bought a new mountain bike. I set out to explore more of the secrets around Basel to plan the nordic walking hikes that I am now guiding – with my eyes restored. My next target is Pratteln. This small town has published the excellent and very detailed “Heimatkunde Pratteln 2003” (Emmy Honnegger et alii) and a nice Website. I pick a few cherries that might add to the walking experience around Pratteln – I love to know more about the places that I am hiking to. And – any misinterpretations are my own fault – I am not a historian. The name “Pratteln” comes from the Latin “Prattelum”=small meadow. Pratellum was a suburban service center for the Roman town Augusta Raurica, with farms and crafts business. It seems that, after the Roman empire had collapsed, the Alemanni did not settle here before the 7th/8th century, and the population continued to speak a Roman language. If the Alemanni had settled here earlier, the alemannic second sound shift would have transformed “Pratteln” to”Pfratzelen” (“Heimatkunde”) or “Pfrasseln” (wikipedia). I prefer “Pratteln” to “Pfratzelen” or “Pfrasseln”. We Swiss just say “Braddele”. The large farms surrounding Pratteln today indicate that it must have been a beautiful service center for Augusta Raurica. Here is Mayenfels above Pratteln that is now a school. 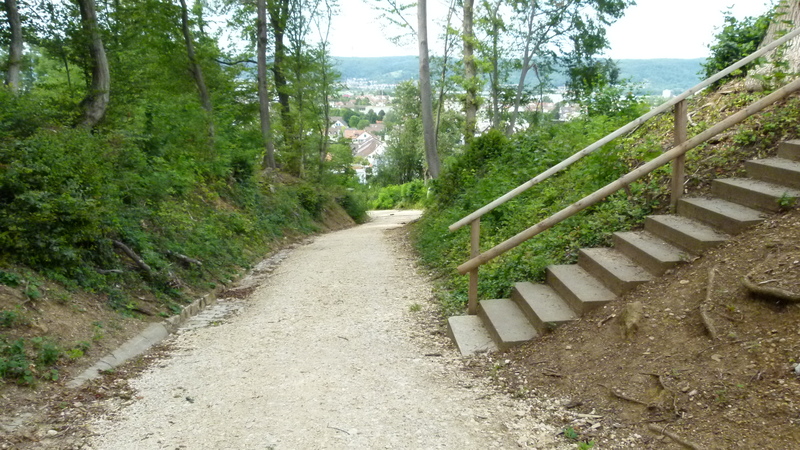 To the south of Pratteln there is the “Hohle Gasse” – a very steep and even today mostly unpaved path that connects Pratteln with the “Chäppeli”. It was here that a school boy found a hand ax in 1974. The ax is older than any other ax found in Switzerland – the estimates I could find reach from 120’000 to 350’000 years (sources: “Heimatkunde”, p. 71 and Website of Kanton Basellandschaft). It is not clear, whether the glacier has transported the ax to this place or whether the owner really lived around Pratteln. Too long ago to know for sure. 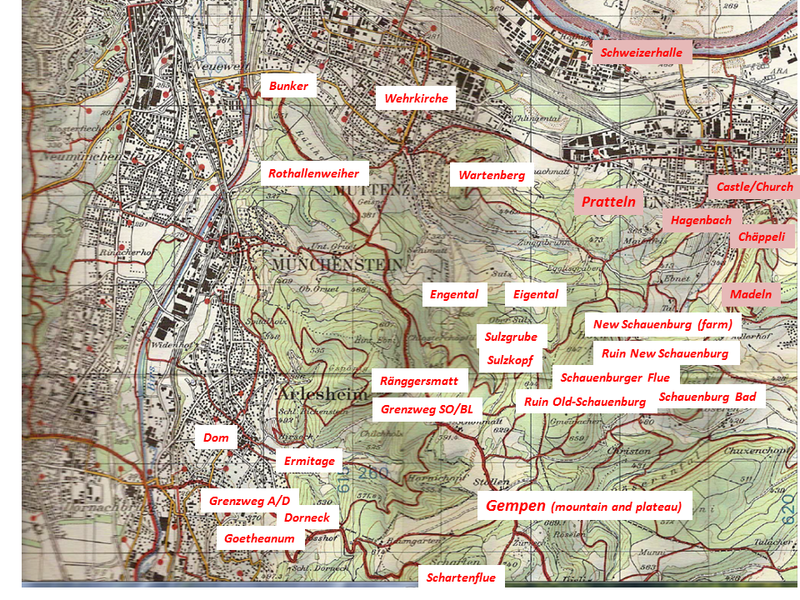 Signs of settlements from stone, bronze and iron age have also been found around Pratteln (see Heimatkunde p. 72). Until around 900 AD the monastery of Murbach (Alsace) had possessions in Pratteln. Reminiscence today: The church of Pratteln is dedicated to Murbach’s patron, Saint Leodegar. The church was later sourrounded by a wall to protect it against the floods of the Talbach (Heimatkunde, p. 97, the wall is called “Kirchenbering”). Other reminiscences of those early days can be found in the field names. For instance starting around 700 AD, forest areas were cleared to gain space for agriculture. These areas were then named Blözen (related with “entblössen”=to bare), Rüti (medieval German “ruiten”=to clear) or Stockmatt (when the thick roots (“Stock”) remained in the meadow (“Matt”)). Other names describe the topology: “Halden” is less steep than a “Rain” (Moderhalden and Blözenrain). “Goleten” points to a landslide that left stone blocks (My Ernst also said “Golete”). 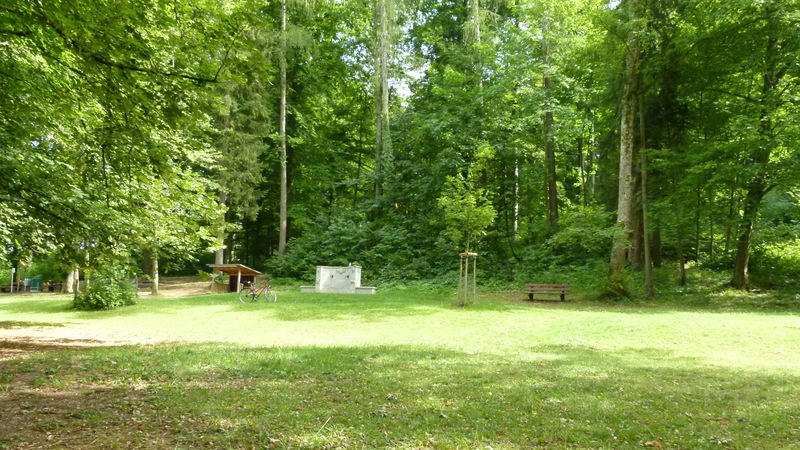 In the “Cholholz” – there was a charcoal burning site (Heimatkunde, p. 25f). 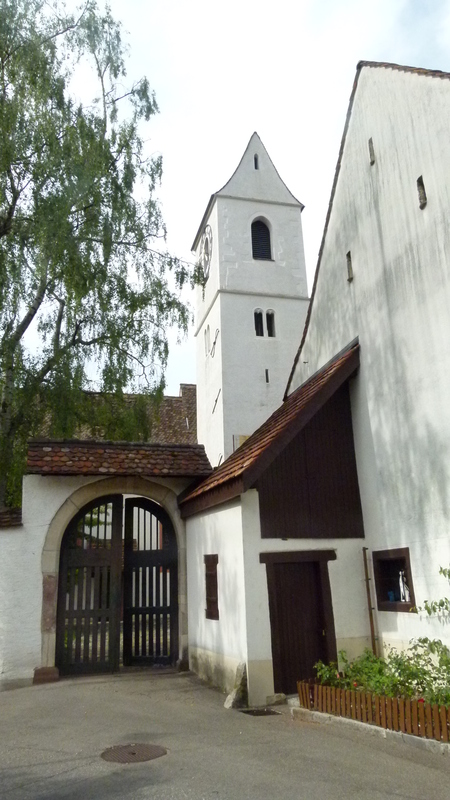 In the late 11th century the monastery of St. Alban, just east of the city gates of Basel, was given possessions in Pratteln. St. Albanstrasse and St. Albanmatte in Pratteln remind us of this today. In the late 13th century the noble family Eptinger settled in Pratteln (presumably it was a feud from Habsburg). In the 13th century, they built two castles, one in Pratteln in the valley (surrounded by water) and a second one on the Madeln hill above Pratteln. After the 1356 earthquake, they rebuilt the castle in the valley. Owned by the government since 1773, it is no longer a water castle today, has been beautifully renovated in the 1960’s (see Ernst Zeugin) and is open for the public (guided tours). 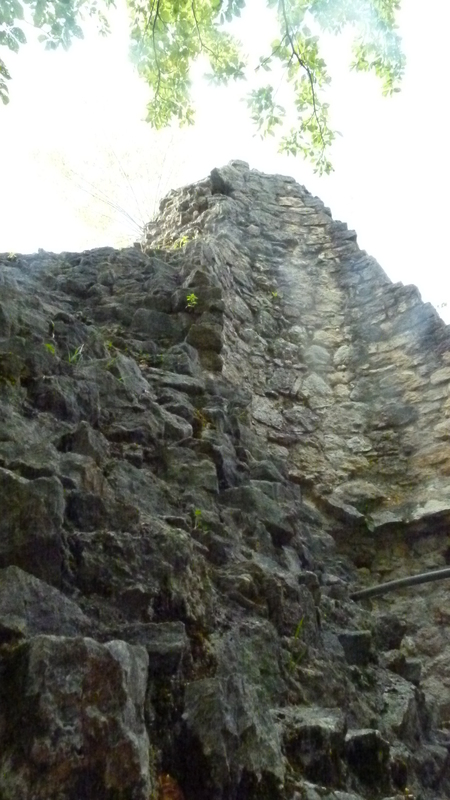 The castle on the Madeln hill (Madlechöpfli) has not been rebuilt after the earthquake. Today only the ditches can be distinguished on the hill, the remains of the ruins have been covered up in the 1930’s to protect them from further decay. 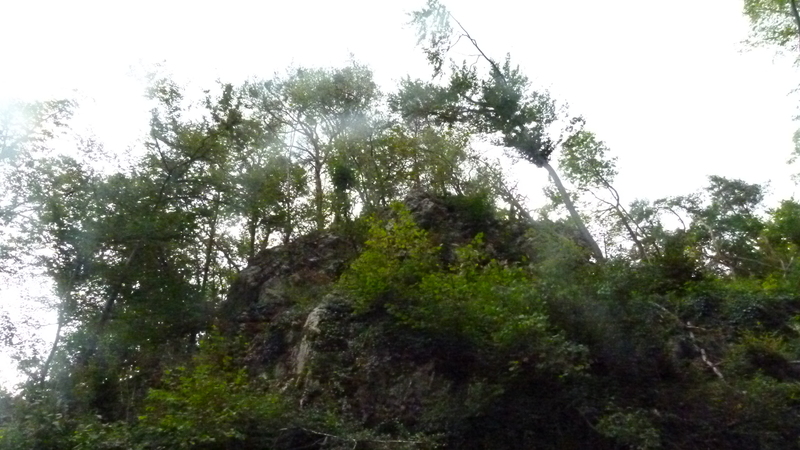 No spectacular ruins for today’s hikers on the Madeln summit – just another picknick spot in the dense forest. But, when having a picknick on Madeln, beware of the Madlejäger or hunter of Madeln. He comes with twelve white dogs, when the weather is changing. He has suffered until these days, because he had killed the owner of Schauenburg to marry the widow (Heimatkunde, p. 318). Below, the “bosky” highest point on the mountain range in the background is the Madeln hill. In the 15th century, Hans Bernhard von Eptingen built the monastery of Schauenburg and a chapel with a hospice in the Geisswald just above Pratteln. 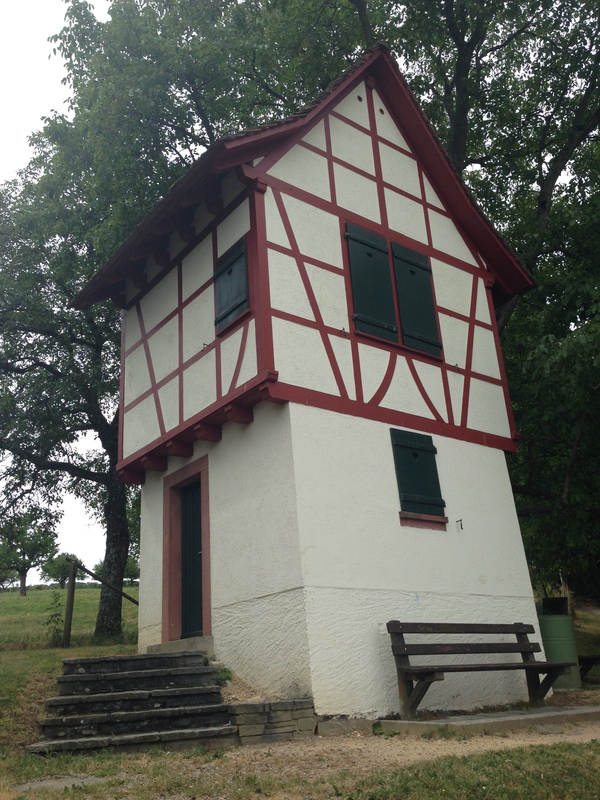 The place is called “Chäppeli” which reminds us of Hans’ chapel that does no longer exist – after the reformation (1529) the stones have been reused to build the parochial house of Pratteln. The fountain is said to give curative water and the Geisswald seems to be an energy spot emitting 8000 Bovis (“Geiss” pointing to what we call Kraftort in German). This was a good place for a chapel and now it is a good place for a vast picknick and play ground. The foto shows the area with the fountain in the background. In 1521 the family Eptinger sold the castle and part of Pratteln to Basel – for 5000 Gulden. 1549 the Habsburgians gave up the rest for 3000 Gulden. However, with their coat of arms – an eagle with red tongue and red claws – the noble family Eptinger is omnipresent today, on banners, on the cars of the firebrigade, in gardens… everywhere. 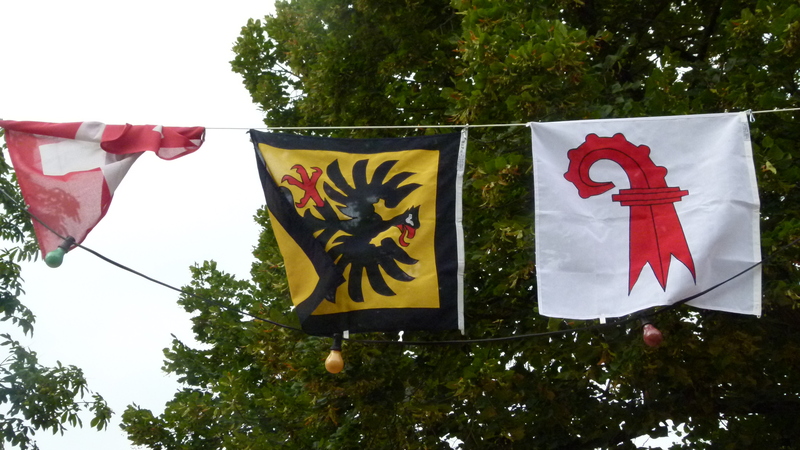 To differentiate their banner from the emblem of Eptingen (also a former possession of the Eptinger family), Pratteln has added a black frame. 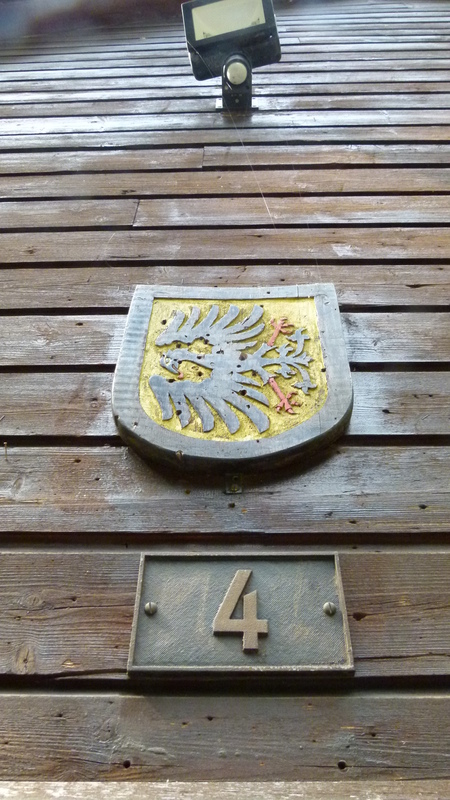 I found the emblem on the little hut at the picknick spot “Chäppeli”. and everywhere in the center of Pratteln that today, July 31st, is preapring for the Swiss national holiday on 1st of August. In the early 19th century salt was found near Pratteln. This started the industrial development. Based on a geological map, Peter Merian forecasted the chance of finding salt on the shores of the Rhine. Carl Christian Friedrich Glenck dug, found salt in 1836 (116m under the ground) and a year later, he opened the first saline factory. Now the Swiss Rhine Salines produce 450’000 tons of salt a year in the valley and on the adjacent hills of the Plateau Jura, south of Pratteln and Muttenz. The presence of salt as an important component attracted chemical factories. From the motorway, I have always seen the signs of the “Säurefabrik” (“acid factory”) – now I know, the Säurefabrik came here in 1918 to combine salt with iron sulfur which results in salt – and sulfur acid (Heimatkunde, p. 107). 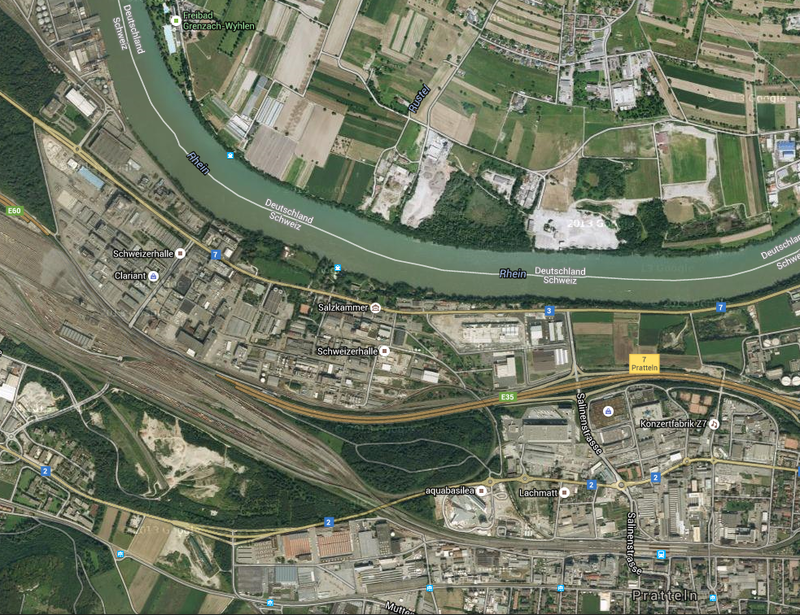 And Ciba, Novartis, Sandoz and many more national and international enterprises form the industrial complex of Schweizerhalle between the railway and the Rhine river today – this sight is taken from Google Earth. Despite the industrial evolution, Pratteln kept its charming historical center and makes it worth a visit. 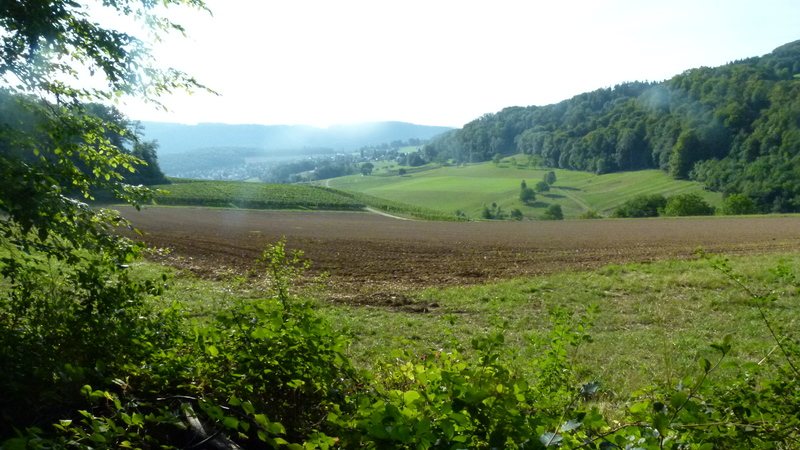 There are vineyards to the south of Pratteln. They were mentioned first in the books of the monastery of St. Alban in 1284. The production was then around 60’000 liters. In 1749 a historian praised the vines of Pratteln, “in particular the red wines are among the good and dense wines of our region (gut und kräftig).” (Heimatkunde, p. 170). In 1807 there were 47ha of vineyards (in the valley and on the hills). 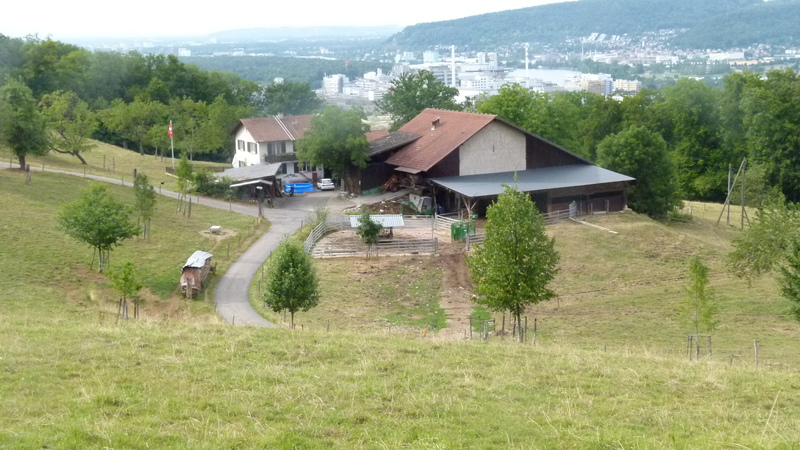 Now just about 6.7 ha are left, all on the eastward looking slopes of the Ebnet (see Weinbauverein Pratteln). There are two professional and 20 hobby wine growers producing about 60’000 bottles a year. 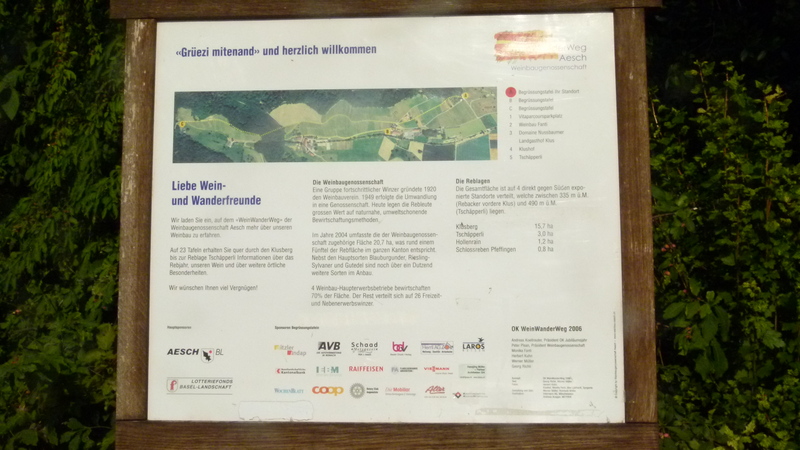 One of the two professional wine growers runs the Leuengrund. It has a small restaurant (open from October to February; this is a Straussen- or Meienwirtschaft, announced by a bunch of flowers, a custom based on Charlemagne (768-814)). Find below the Leuengrund with its gorgeous view. I will come back here in autumn, when the restaurant is open. 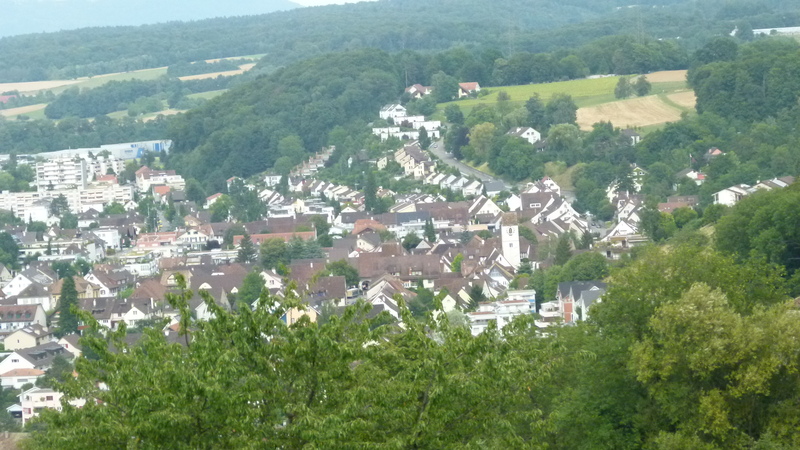 … and the view over Pratteln to the Dinkelberg beyond the Rhine river and the Vosges in the background to the left. Well, I am impressed by the history of Pratteln. I love to share it with the nordic walking group, when hiking here. Andreas and Helga, thank you for having opened my eyes for the secrets of my home region around Basel.